It’s been said that early risers are the most productive, but that’s simply not true. Night owls can be just as productive – if not more so – but they need to have the right frameworks in place to succeed. The problem is that there are plenty of resources for morning people to reach next level productivity but very little is out there for the late night achiever to hang their hat on. That’s where The Night Owl Action Plan comes to the rescue. 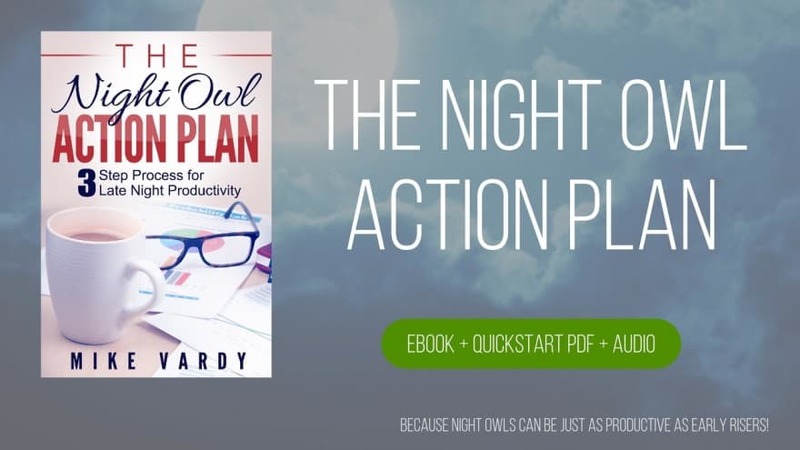 Designed by productivity strategist and self-proclaimed night owl Mike Vardy, The Night Owl Action Plan offers the tactics, tools, and tips you need to level up your late night productivity so that you can keep up with those early birds. He even offers practical approaches on how to deal with the various circumstances that may have “wired you” as a night owl in the first place, whether it be the schedule of your day job, a new addition to the family, or a long-standing pattern of late nights and not-so-early mornings. The Night Owl Action Plan Guide: This short 20 page ebook (PDF with Kindle and ePUB versions available in a future update) offers up ways you can not only survive – but thrive – as a night owl. The Night Owl Action Plan Evening Quickstart: This PDF is a worksheet that you can use to map out the next day’s actions and build an evening routine – both quintessential aspects when working towards thriving as a night owl. Plus you’ll get additional bonus materials through updates to The Night Owl Action Plan at no additional cost! It’s time to level up your late nights and – if you’re wired to be a night owl – stop fighting your body clock. The Night Owl Action Plan will help you make the most out of the moonlight hours, so order your copy today! GET THE NIGHT OWL ACTION PLAN FOR JUST $10 NOW!